Frequently asked questions for our beauty box subscription service. Little-Known Box is a luxury beauty subscription box that ships 5-6 products to you per month, to discover, try and enjoy at home. As well as monthly subscriptions, we offer one-off boxes, gift subscriptions and limited edition boxes. We are passionate about featuring and introducing you to upcoming, niche and independent brands. You might just see some well known brands featured, but they will be little-known products or new launches! With the exception of our limited edition boxes which feature brands and products that fit the box theme. What products will I get? No, we also have One-Off boxes so you can order a box whenever you feel like it, if you don’t want to commit to a subscription. We have pay monthly subscriptions available, or prepay 3, 6 and 12 month plans. We also have gift subscriptions if you want to buy a subscription as a present. Have a look at our ‘How it works’ page for more details. You should receive our emails if you have purchased something from our site or signed up for a subscription. Emails will be sent to the address registered on your account. Check your junk/spam folder incase they are being stopped by your spam filter. 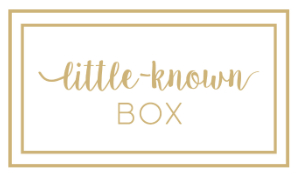 If you would like to join our newsletter but haven’t yet purchased anything from us, please email customerservice@littleknownbox.com and we will be happy to add you to our mailing list. 1) A monthly subscription. £13.95 per month (plus P&P;). This is a monthly subscription, you can cancel anytime but we need to receive your cancellation prior to the 14th of the month. Any cancellation past the 14th will end with the following months box. 2) A 3 month subscription. A one-off payment of £38.85 (plus P&P;). This is £12.95 per box. 3) A 6 month subscription. A one-off payment of £71.70 (plus P&P;). This is £11.95 per box. 4) A 12 month subscription. A one-off payment of £131.40 (plus P&P;). This is £10.95 per box. Postage and packaging is £3.75 per delivery. You can see the options and join on our ‘Join Now’ page. No, the box cost and delivery costs are the only charges. Subscriptions do auto-renew so be sure to cancel if you no longer want your box. You can do this in your account or alternatively, email us on customerservice@littleknownbox.com and we will be happy to help you. Payment can be made via credit or debit card. We accept payment by most credit and debit cards. Please check that your voucher code is still valid and hasn’t expired. If you are still having problems, please contact us and we will be happy to help. We don’t reveal in advance what the box products will be, it would spoil the surprise for you and the unboxing excitement! Sometimes we will have a sneak peek of our favourite product in the upcoming box on our website or social media accounts. You can browse our website to get an idea of the brands and products that may be featured in upcoming boxes. Limited Edition boxes fit a specific theme and therefore, the contents will sometimes be shown and therefore not always a surprise, depending on the box theme or promotion. You will receive a box insert in your box with information on each product. You can also find further information on our website for the individual products, descriptions for use and information on the product ingredients where possible. Will I like the products in my box? We work hard to feature a large selection of products and brands, there is something for everyone in our boxes. Can I see a list of brands you are working with? We will be adding names to our ‘Brands’ page as we partner with more brands. Check back soon for updates. Where can I buy a product I like? We will give information on our website and the box insert, showing where you can buy more products from the same brand. What if I don’t like the products in my box? If this happens, make sure you email us to let us know. It’s important to us to hear your thoughts and we will respond to your email. We will try our best to resolve any problems you may have with your box. Products that may not be for you, always come in useful for gifts and presents for friends! Will I get the same product more than once? We create boxes that are as exciting and varied as possible. Occasionally individual products may be featured twice but are likely to be different shades or formulas. Unfortunately we are not able to guarantee that your box will be free of certain substances or ingredients. We take allergic reactions very seriously but a persons allergy problems are outside of our control, and as such we cannot promise that you will not have an allergic reaction to a featured product. If you have an allergic reaction to a product, we understand you may not want to continue your subscription. If you suffer from an allergy to certain ingredients, substances or even certain brands or product types, we strongly recommend that you to carefully check the ingredients of a product before using it. If in doubt, do not use products that you think you could have an allergic reaction to. We currently only ship within the UK but please check our website or sign up to our newsletter for regular updates. Monthly boxes are dispatched around the 21st of the month, you’ll receive a dispatch email with more details. Please note that this is not guaranteed and you should allow 14 days for delivery, some parcels can take longer due to items being delayed, postal delays and during peak periods such as Christmas & New Year, and bank holidays. Limited Edition boxes ship at alternate times and you will be notified of the dispatch date. If you purchase a gift subscription, yes they are. If you are purchasing a One-Off box as a gift, this may be sent at a different time to the monthly boxes. Yes you can, you will be promoted to add a gift message when you purchase a gift subscription. Joining our mailing list enables us to keep you updated via email about new products and brands, promotions and limited edition boxes. It will also allow us to send you promotion offers that you won’t want to miss! If you join our mailing list you can unsubscribe at any time if you decide you don’t want to receive our newsletters. Why isn’t my item exactly the same colour? We try to reproduce colours on the site as accurately as possible. However, different computers and cameras can reproduce colours differently so exact colour matches are not possible. We also cannot control the colour of product images given to us by brands for us to use. How can i find out more about Little-Known Box? To find out more about Little-Known Box, please read our ‘About’ page. Yes! We are always interested in hearing from brands, especially; new, upcoming, niche, vegan, organic or Little-Known brands (we will also feature Little-Known products from well known brands). If you would like your brand to be featured in Little-Known box or if you would like to collaborate/partner with us in any way, please email us, we would love to hear from you. Yes! We are always interested in hearing from bloggers and social influencers. If you would like to review Little-Known Box or collaborate/partner with us, please email us, we would love to hear from you. Please email us on customerservice@littleknownbox.com and we will do our best to help you.